My team members and I had a crafting session the other day (well, OK, it also involved a lot of cake and tea!). One of them cut a tree from Watermelon Wonder cardstock with the Thoughtful Branches dies and did it so neatly that I couldn't pass up the opportunity to use that negative space. So I cut another tree from a scrap of Early Espresso cardstock, fit it into the space and layered it onto a piece of Whisper White cardstock, adding a birthday greeting and some Flirty Flamingo Ruched Ribbon. 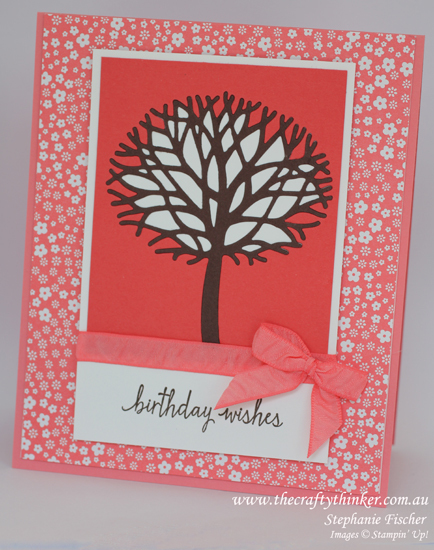 The card base is made from Flirty Flamingo cardstock with a layer of Flirty Flamingo patterned paper. If you like the Thoughtful Branches sets and don't yet have it - act quickly! It's only available during August.